Ben Hope has reached breaking point. With nowhere to turn, Ben attempts to lose himself, camping high in the Alps on the French-Swiss border, finding oblivion in a bottle. But destiny has other plans. He is found by a silent order of monks who take him in, letting him recover in his own time, gradually letting him become one of their number. At last, Ben has found peace. But this is Ben Hope we’re talking about. And when he finds tunnels in the mountain beneath the remote monastery, he also finds trouble. These caverns contain gruesome secrets which hint of the region’s darkest days centuries ago, secrets that some would kill to discover. Ben leaves the monastery on a routine chore into the nearby town. He returns to find a bloodbath. There are clues within the devastation and from that minute on Ben Hope has a new purpose in life, one goal, and that is to bring to destruction the people that did this. Nothing will stop him and it’s all we can do to hang on as Ben embarks on his furious quest. 2015 has been a particularly good year for Ben Hope fans with The Forgotten Holocaust published earlier in the year and this June we have the eleventh, The Martyr’s Curse. The books tend to fall into those that deal with crises in Ben Hope’s own life, such as the marvellous The Armada Legacy, or they focus on unravelling the mystery of an ancient puzzle. This was especially the case with the earlier novels. More recently the emphasis has fallen on developing Ben Hope’s rich and intriguing character leading to mature and wonderfully written thrillers, intense and focused. It is now time for the mystery to be put back into Ben’s life and The Martyr’s Curse continues and intensifies a process that the preceding novel,The Forgotten Holocaust, began. The result is a resounding success and, to my mind, the best of a fantastic series. If you’re new to the series then The Martyr’s Curse would provide a great way in. In a sense, Ben Hope is starting this adventure with a clean slate. A lot of the loose ends from the past have been tied or lost. They might have left him an emotional wreck but they’ve also left him free to pick up the pieces and start again. And avenging his friends in the monastery gives him just the focus he needs to kickstart his life. Once you’ve found your way in to Ben’s life, though, there’s every chance that you’ll be hooked and go back to the beginning and The Alchemist’s Secret. I’m not going to say anything about the mystery here but it’s a corker. Suffice to say, the villain is fabulously nasty, the locations are vividly painted and the action scenes are adrenalin pumped. Arguably, The Martyr’s Curse is the most violent of the series. Stakes are extraordinarily high and there’s nothing that Ben Hope won’t do to stop the baddies in their tracks and some of it isn’t pleasant. There is a female lead and she plays a significant part in the novel as well as in helping Ben keep his cool. As things turned progressively nasty I was grateful for her presence, as no doubt were the baddies left scrambling in the dirt. The Ben Hope novels are, equally with Andy McDermott’s Nina and Eddie books, my favourite thrillers by a mile, providing the best of escapist reads. 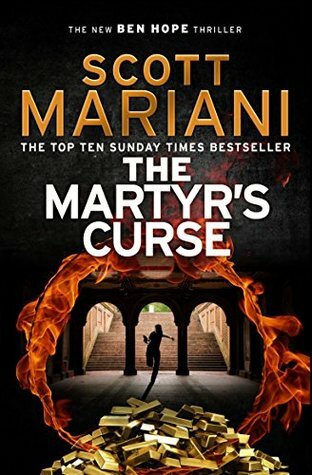 It was no surprise to discover that The Martyr’s Curse is a thrilling adventure of the highest quality and it kept me on the edge of my seat from start to finish. It was fantastic to spend more time with Ben Hope, flawed and wonderful as he is, in this the finest of all his adventures. This entry was posted in Review, Thriller and tagged Thriller on May 28, 2015 by Kate (For Winter Nights).